The Kinghurst bypass kerb addresses this problem by removing a section of the existing kerb and replacing it with a duct which collects the rainwater on one side of the hump, diverts it past the obstacle and returns it to the gutter once the hump has been passed.The units can be used with humps constructed from any commonly used materials.The bypass kerbs are installed after removing the kerb for the full length of the kerb plus 250mm at each end. This is to allow water to enter and leave the unit. The units are highly adaptable and can be used in locations with a wide range of kerb depths. Standard units are 100mm deep. Other units available include 75mm and 150mm. Intermediate sizes are accommodated by sinking the units partially into the surface.The units have anchor brackets welded to the underside. These are cast into a bed of concrete to retain the units against vertical movement. The units are restrained against horizontal movements by the footpath on one side, and the hump on the other. 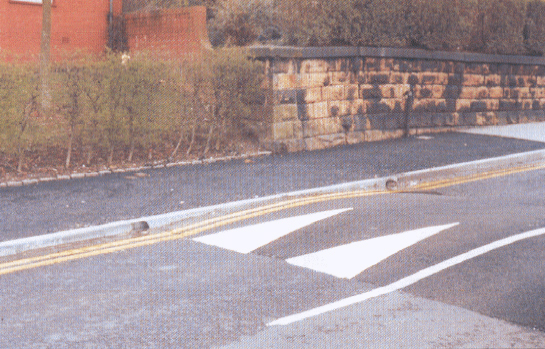 The units are particularly useful with raised footpath crossings.Smooth transitions are easily achieved with all kerb profiles often without the need for drop kerbs. Slow curves can be dealt with by using short lengths and laying them slightly out of line, like laying kerbs on curves. These short lengths must be specified when placing an order as we assume units will be used in a straight line. - The risk of transit or site damage is eliminated. Thrown from a wagon the units bounce!